Dr. Perlman will educate you about the benefits of dental implants. Dental Implants or Dental Bridges? The development and use of dental implants is one of the biggest advances in dentistry in the last 25 years. They are the most stable and longest lasting option for replacing missing teeth, and are the closest you can get to healthy, natural teeth. When natural teeth cannot be salvaged, Dr. Perlman recommends dental implants for patients who are able to receive them. A dental implant is basically a replacement for the root or roots of a tooth. The implant device itself is a titanium post that is inserted into the jawbone, where it functions as a strong anchor for replacement teeth. A connecting piece, called an abutment, is placed on top of the post and serves as the attachment point for a dental crown, a dental bridge or a denture. The titanium post’s special property of fusing to the bone cells — called osseointegration (“osseo” – bone; “integration” – fusion or joining with) — is the biological basis of dental implant success. This union forms a strong and durable anchor for your new teeth. Generally speaking, if you have lost teeth, you are a candidate for dental implants. Nearly anyone in good general health whose jaw has finished growing is a candidate. For people with certain health conditions, Dr. Perlman will consult with the patient’s physician to ensure that they able to undergo this procedure safely. In the past, people with too much bone loss in the jaw could not receive implants. Due to advances in technology, these patients can now successfully receive dental implants. Missing bone needed for successful implant placement can now be regenerated with bone grafting techniques. In addition, Dr. Perlman uses 3D technology to find areas with the densest and greatest volume of bone for optimum dental implant placement. Dr. Perlman can help determine if you are a candidate after a personal consultation and a study of your dental and medical history. 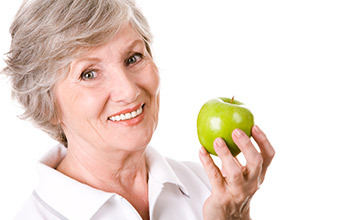 Dental implants provide the same chewing and biting power of natural teeth. Dental implants are very long lasting and durable when properly placed and cared for over time. Implants have the chewing and biting power of natural teeth. There is no compromising of adjacent teeth to replace a missing tooth, as with a dental bridge. The gap left by a missing tooth is filled. This prevents bacteria from accumulating on the adjacent teeth and helps prevent gum disease. 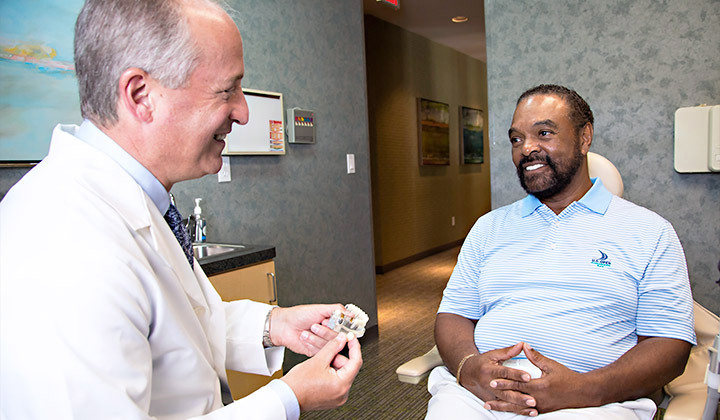 Implants preserve natural bone, helping to stimulate bone growth and prevent bone loss. You can brush, floss and care for implants exactly the way you would natural teeth. Dental implants are fixed in place and fuse naturally with your jawbone, meaning your replacement teeth won’t move, click or shift. Dental implant treatment has a track record of reliable, long-term successful outcomes. Our 3D Cone Beam CT Scanner is comfortable and fast. Because of major advances in technology in the last decade, Dr. Perlman can place dental implants accurately and efficiently with minimal to no post-operative discomfort. 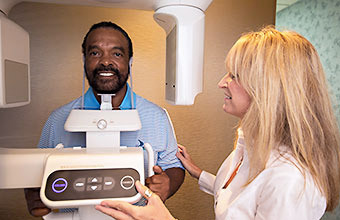 Dr. Perlman uses his 3D CT scanner to obtain a 3D 360° image of your entire jaw, tooth structure and supporting bone around your teeth. These images provide Dr. Perlman with the information to have surgical guides created for your procedure. This is a template that fits over your dental arch and shows the precise location and angle where implants are to be placed. This allows Dr. Perlman to plan exact treatment steps ahead of the time, eliminating unnecessary cutting and suturing. 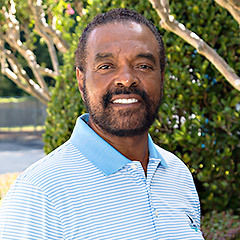 Learn more about our dental implant procedure. For years, dental bridges have been used to replace missing teeth, but the problem with this tooth replacement procedure is that the patient’s natural teeth on each end of the bridge must be shaved down to attach the bridge to them. This weakens the natural teeth and can cause major complications over time. The average life span of dental bridges is only 5-10 years. Dental implants are a more conservative tooth replacement option, as they do not require alteration of the patient’s other healthy teeth. 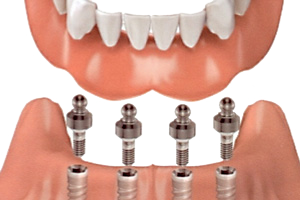 Implants provide the biting and chewing pressure necessary to prevent bone loss. This not only preserves the jawbone supporting the implant, but maintains the stability of the adjacent natural teeth as well. Implants can last a lifetime with regular care and are the strongest and most lifelike tooth replacement option. The jawbone is stimulated, strengthened and continually renewed by the biting and chewing pressure of the teeth. When teeth are lost, the bone under the missing teeth gradually dissolves away and the bony ridge under the missing teeth sinks. Pressure on the gums from wearing a denture actually accelerates this bone loss, which eventually collapses the lower third of your face and makes you look much older. Dentures have only 10% of natural chewing and biting power, making it hard or impossible to chew many foods that are needed for good health and making it necessary to resort to a blender if you eat those foods at all. Dentures can make noise or click when talking or eating. Dentures often need adhesives to be secured in the mouth. Dentures do not provide the biting and chewing pressure necessary to maintain the size and density of the supporting jawbone. The type of pressure exerted when chewing with dentures actually accelerates the bone loss and the collapse of the face. Dentures slip and need continual refitting over time as the bone height under the denture keeps deteriorating. Dentures cover the roof of your mouth and interfere with your sense of taste and enjoyment of food. Dr. Perlman recommends that dentures be stabilized with dental implants that snap into the denture. This greatly improves chewing power and stops the denture from moving around. Additional implants allow the denture to be fixed permanently, providing even greater stability. 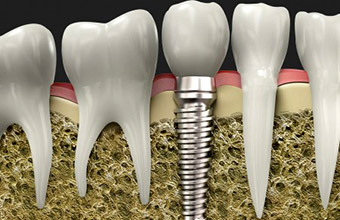 Dental implants preserve and stimulate natural bone, and actually help to stimulate bone growth and prevent bone loss. Learn more about implant-supported dentures here.